I am so happy The Hillshire Brands Company sponsored this post for delicious, satisfying Muffin Tin Eggs; craveable crisped ham, green onions, cheddar cheese, and egg baked to puffy, golden perfection. 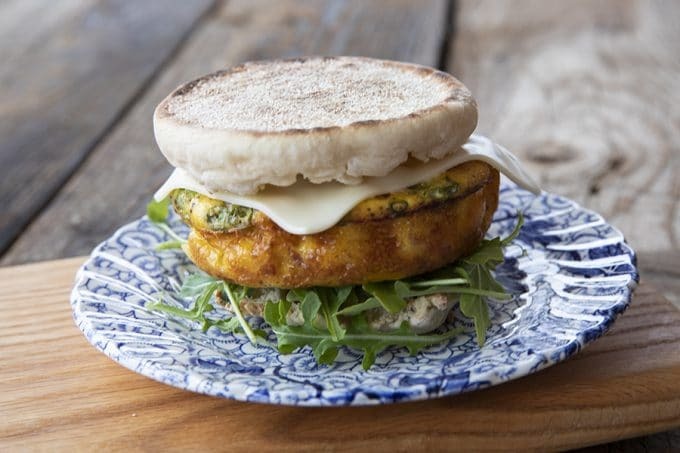 These egg muffins are a perfect topper for toasted English muffins or beside a salad for a full, light meal. 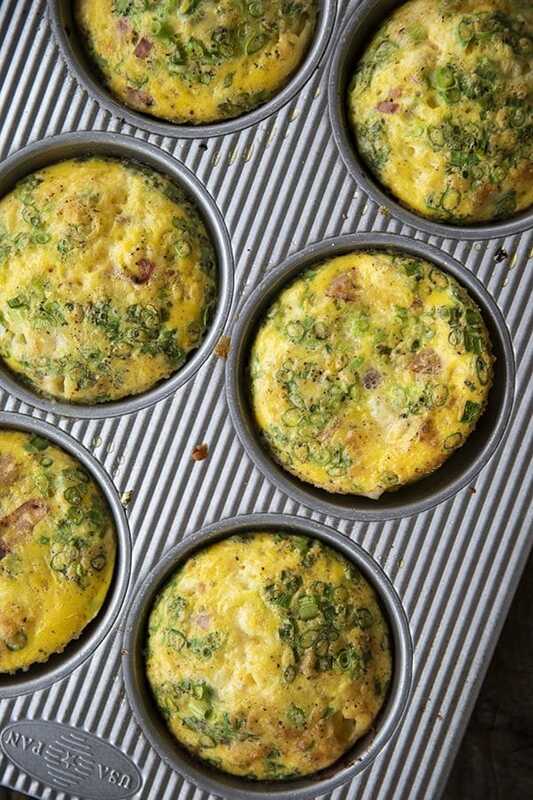 Muffin Tin Eggs are a standby option for busy mornings here at our house. 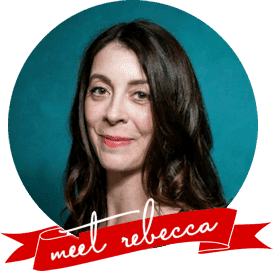 They’re one of the most ridiculously simple, grab and go breakfasts I have in my repertoire, and they make everyone here happy because of how easily they’re customized. In our Muffin Tin Eggs, Hillshire Farm® Premium Carved Slow Roasted Seasoned Ham is finely chopped and lightly pan-fried. This gives concentrated, caramelized ham flavour to our finished breakfast egg muffins. Craveable crisped ham is divided between muffin cups. Then comes minced green onions, cubed cheddar cheese, and beaten egg, which is then baked to puffy, golden perfection. 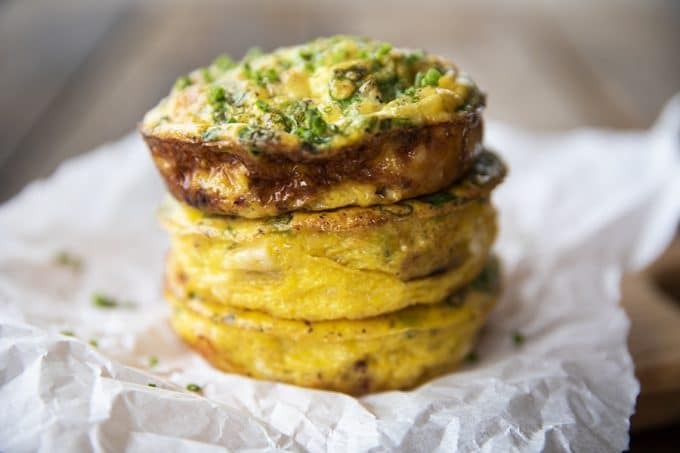 These egg muffins are a perfect topper for toasted English muffins or beside a salad for a full, light meal. Once you try this recipe, you’ll be thrilled at how easy, delicious, and economical they are. There are many variations of muffin tins on the market, so you have options for this recipe. My personal preference is for muffin top tins because I like the size and shape of the finished egg muffin recipe for topping English muffins. If you don’t have one, and don’t want to invest in one, that’s absolutely fine! You can use a standard muffin tin or standard muffin sized silicone muffin liners. The advantage of the silicone muffin liners is that they can stand alone on a sheet pan and if your eggs get a little stuck, you can turn the silicone liners inside out. Try doing that with a metal muffin tin. Alternately, if you’d like little bite sized muffin tin eggs, you can certainly use a mini muffin pan. Just keep in mind that if you’re using these smaller muffin tins, the time needed to bake them will be quite a bit shorter. I touched on it above, but you need to know just how easy these muffin tin eggs will make your morning. The plan goes like this. On Sunday evening you do the following. Generously grease a muffin tin (or silicone liners), toss your pan-fried ham and other ingredients into the wells, then pour beaten egg over them before baking. Run a thin, flexible knife or spatula around your baked eggs in muffin tins, then flip the pan over and tap them out. If any are stuck, slide that flexible spatula in to coax them out. Now eat one, because you’re not a machine, friend, and these are going to smell and look delicious. Individually wrap the rest of them, put them in a container, and slide the container into the refrigerator. Now you are all set for your weekday breakfasts. You have a soul-satisfying, grab and go breakfast that is infinitely better than any bowl of cereal or take out option for keeping you fueled until lunch. Speaking of lunch, there’s option #2; the light lunch option. 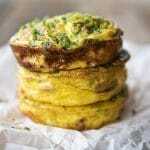 Pack one of your muffin tin eggs and a salad or some hearty whole grain bread and a little lettuce. Microwave your muffin tin egg if you brought bread, then add a little smear of Dijon mustard or mayonnaise from a single use packet or jar and your lettuce. Now that is a lunch sandwich to remember and keep you going until dinner! Since we’re talking about dinner, you can even turn your muffin tin eggs into a fabulously fast dinner meal. Make a whole grain bread, muffin tin egg, arugula sandwich like we talked about for lunch, but add a bowl of soup like this Tortellini Vegetable Soup, Taco Soup, or Best Slow Cooker Beef Stew with Bacon, a side salad like this bresaola and parmesan salad, and you have a quick dinner that satisfies your heart and your stomach. While you’re at it, you should probably whip up this quick Snickerdoodle Mug Cake for a fast dessert. You saved all that time making your muffin tin eggs earlier in the week, why not spend a little of that on dessert? I have some excellent news for you. These all-natural, convenient carved cuts of meats with no artificial ingredients or preservatives are available with the packaged lunch meat in the perimeter coolers at your local Walmart and the Hillshire Farm Premium Carved Slow Roasted Seasoned Ham is available through Walmart Online Grocery Pickup. Oh, how I love that online grocery pickup. It makes life so easy! On a rainy day, I placed my online grocery order, drove to the canopy protected pickup area, and a helpful Walmart employee loaded my car for me. Am I spoiled? I sure felt like it, but wow was I happy not to get out in the cold January rain! I recommend using large or extra large eggs for your muffin tin eggs. Around here, I use a variety of sizes of eggs for this recipe because, well, my chickens don’t lay consistent sized eggs. This is a pretty forgiving recipe, so use what you have. If you’re using medium eggs, though, I’d recommend adding two more eggs to the total. As noted, you can use any number of types or shapes of muffin tins, just remember you’ll need to watch the recipe for doneness a little sooner if you use shallow tins (like the muffin top pans) or smaller ones (such as mini muffin pans.) If you do opt for the smaller or more shallow pans, start watching your muffin tin eggs around the 10 minute mark. Feel free to change it up a little from time to time. If you can’t find green onions, use chives. If those aren’t available, mince a little onion and pan fry it with the ham, and add a little fresh parsley to the party for a pop of green and a brighter flavour. Pimientos (cherry peppers) add a lovely burst of red, too, if you like them. Preheat your oven to 375°F. Generously grease 12 standard muffin tins and set aside. Finely chop 11 ounces Hillshire Farm Premium Carved Slow-Roasted Seasoned Ham and add to a skillet over medium high heat. Fry, stirring frequently, until the ham is caramelized at the edges and fragrant. Remove the pan from the heat. Use a spoon to divide the chopped, fried ham evenly between the muffin tin cups. Next, divide the chopped green onion and diced Cheddar cheese between the muffin cups. Beat together the eggs, cream or milk, salt, and pepper, until even in colour. Divide this between the muffin tins, pouring over the fillings. Bake for 20 minutes, or until the muffin tin eggs are set at the center, dry to the touch, and golden brown. Let the muffin tin eggs rest for 3 minutes before removing from the pans. 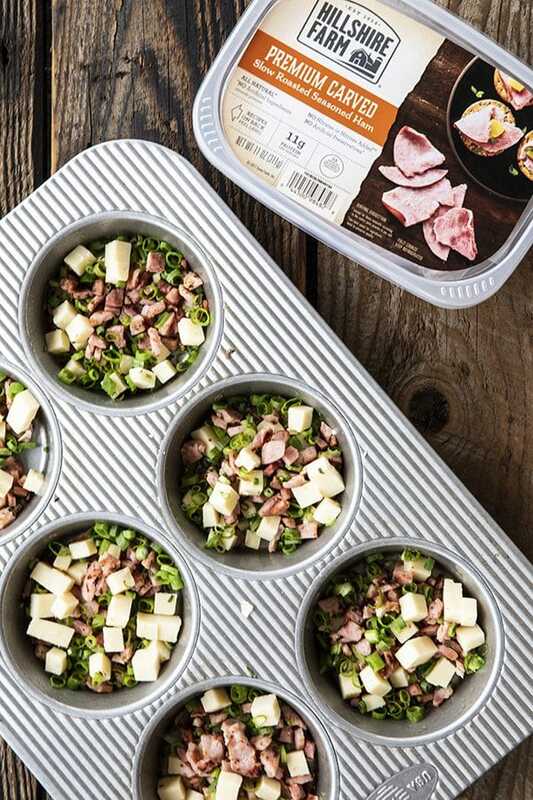 Muffin Tin Eggs; craveable crisped ham, green onions, Cheddar cheese, and egg baked to puffy, golden perfection. 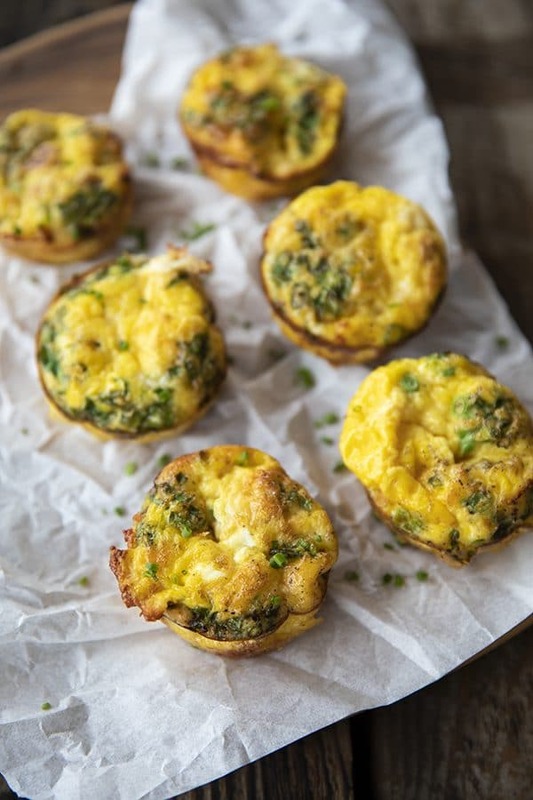 These egg muffins are a perfect topper for toasted English muffins or beside a salad for a full, light meal. Preheat your oven to 375°F. Generously spray 12 standard muffin tins with non-stick cooking spray and set aside. Lovely recipe! I couldn’t find if you mentioned how to store it for the week. 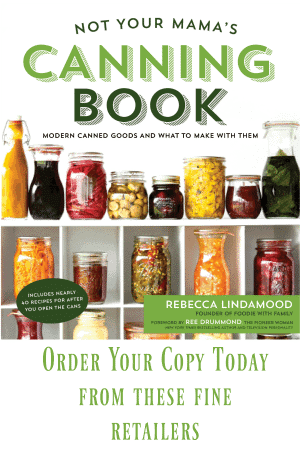 In a closed container in the fridge or freezer? How many days will it last in each case? I have tried at once and their taste is so amazing.